Blank faces stare back at me as I read the prompt “Tell your partner something you might find in a garage.” After a few quiet moments, a student simply asks “What’s a garage?”. Too often we take students' vocabulary background knowledge for granted. Their personal experiences, however, serve as an important piece of their education. Therefore, it is our job as educators to help students develop and build upon their academic and domain-specific language. 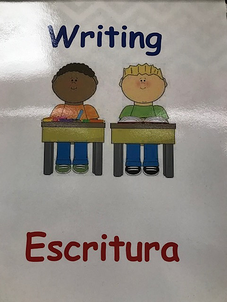 As a 2nd grade teacher with more than 75% of my class composed of English Language Learners (ELLs), I found that my students were struggling to access the vocabulary in the curriculum with the traditional teaching methods. As a result, I worked with my BetterLesson Instructional Coach, Natalee Hawks, to identify and utilize different vocabulary strategies in my daily teaching practice. I looked for ways to make the learning more hands-on, linguistically appropriate, and beneficial to the students attainment of new terms. Below you will find some of the vocabulary strategies that, with Natalee's coaching support, I have found success in using in my classroom. One of the quickest ways to support students in the development of the four language domains (Listening, Speaking, Reading, Writing) is to incorporate multiple lessons in explicit vocabulary instruction. Through consistent vocabulary teaching points, students are more quickly and authentically able to acquire new academic language. 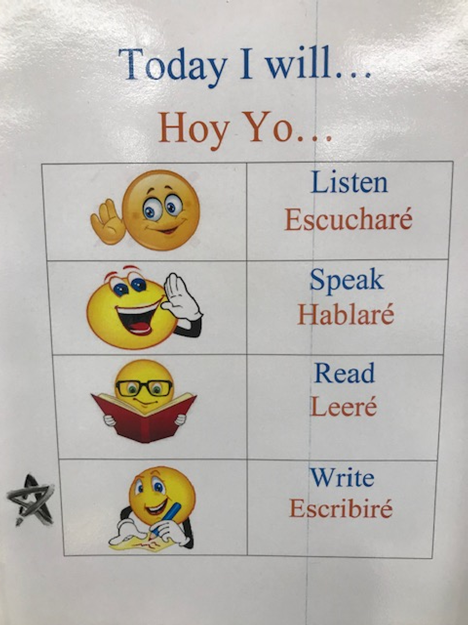 Chart of the 4 language domains displayed in my classroom Work on Writing rotation sign A smaller, colored chart of the 4 language domains is stationed at each of the Daily 5 rotations around the room. A star is placed next to the language domain(s) focus of the rotation, along with the name of the rotation. The following strategies are a few examples of how you can easily begin to support students vocabulary acquisition within the classroom. Sentence frames are simple to incorporate into your lesson plans. For example, when you give students an assessment prompt to check their understanding, you can quickly introduce the sentence stem for students to use in their responses. Also, accountable talk stems provide more reluctant students with a low-risk way to share their thoughts with the group. 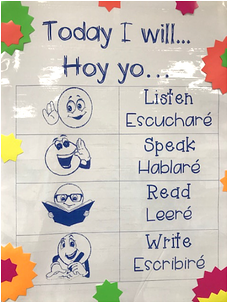 I have found that when providing my ELL students with accountable talk stems, they are more willing to participate since the first half of the sentence is already started for them. Furthermore, talk stems model appropriate academic language for students and shows students how to express a complete thought. For young learners, especially ELLs, consistent use of accurate language is beneficial to building all four of their language domains, which is supported by the sentence frames. 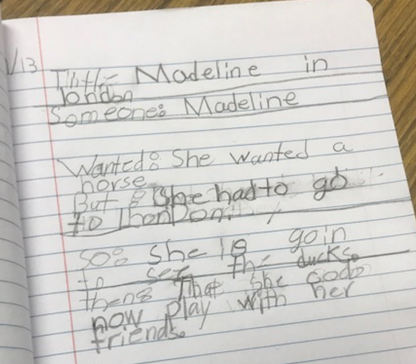 ELL student used the sentence frame Somebody, Wanted, But, So, Then to complete a Reading journal response. 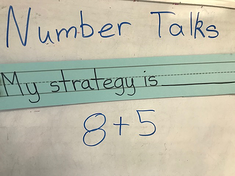 "My strategy is..." sentence frame used for Math Number Talks. Students use the sentence frame to help explain their ideas when solving the math problem. 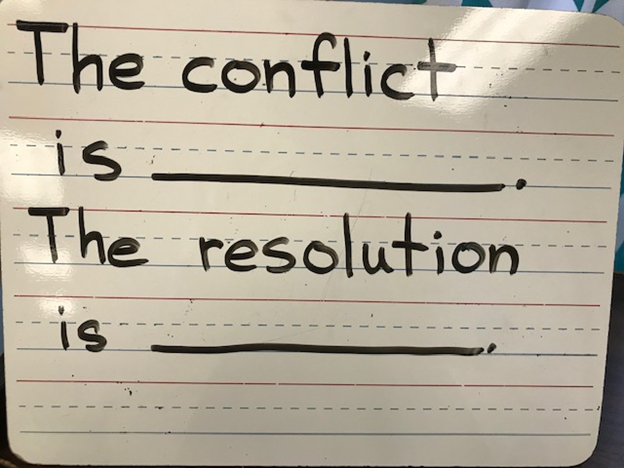 Sentence frame used during a Reading group written response. 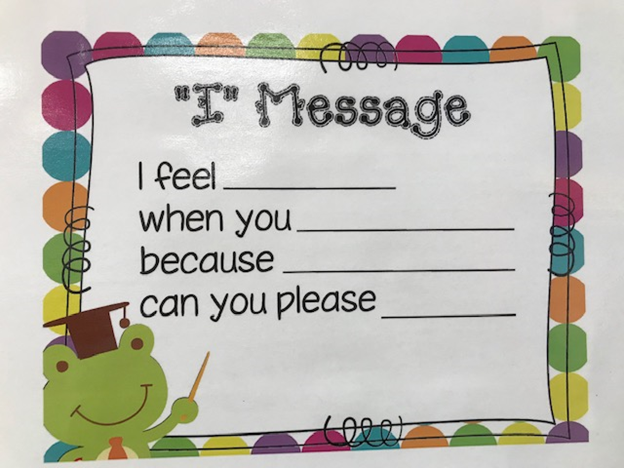 Sentence Frames can also be used for social-emotional learning, in helping students to express themselves more accurately. To learn more about how to support your students to use sentence frames, consult the "Accountable and Academic Student Talk Stems" strategy in the BetterLesson Lab. 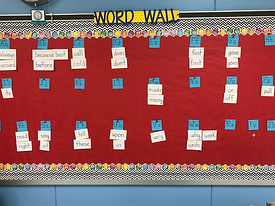 An interactive word wall is a space in the classroom that provides an opportunity for students to authentically engage in learning and to make connections between terms and content in the classroom using words, visuals, and graphics. An interactive word wall displays prominent terms or vocabulary from the unit or lessons and can help students see patterns in words so that they can build their phonics skills and develop a deeper understanding of the terms. 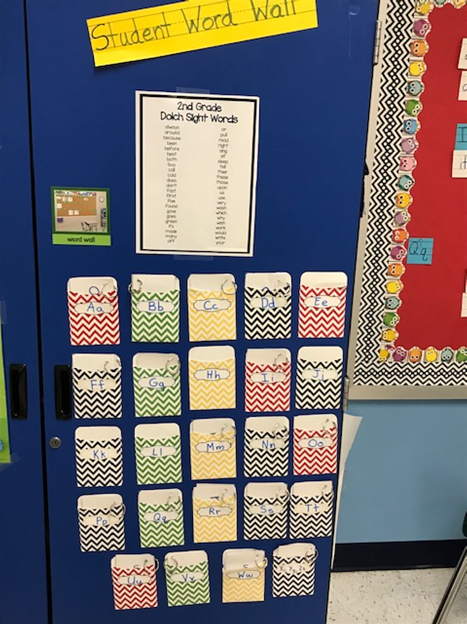 In the lower grades, you may opt to do a word wall focused on sight word acquisition. In the middle and upper grades, the word wall can include content-specific vocabulary. 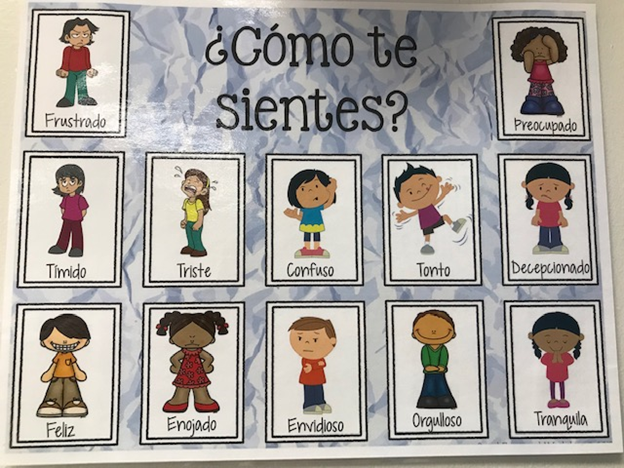 If your class is composed of several ELL students, you may also decide to create a cognate word wall that includes key vocabulary cognates for both English and the other primary language. For example, you could have an English-Spanish cognate wall. 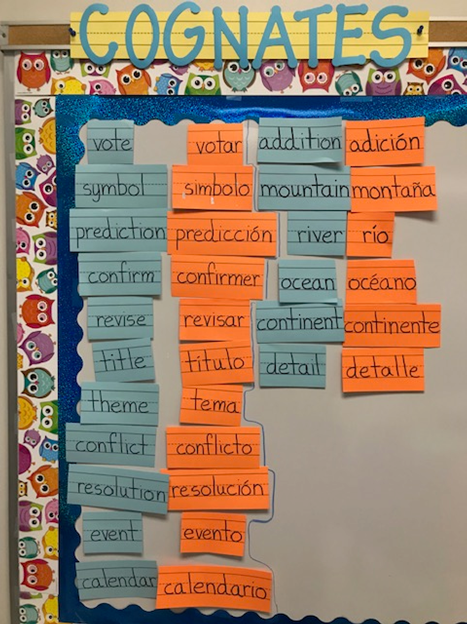 You may decide to choose just one of these variations on a word wall or have a combination of all three; it simply depends upon the needs of your students. 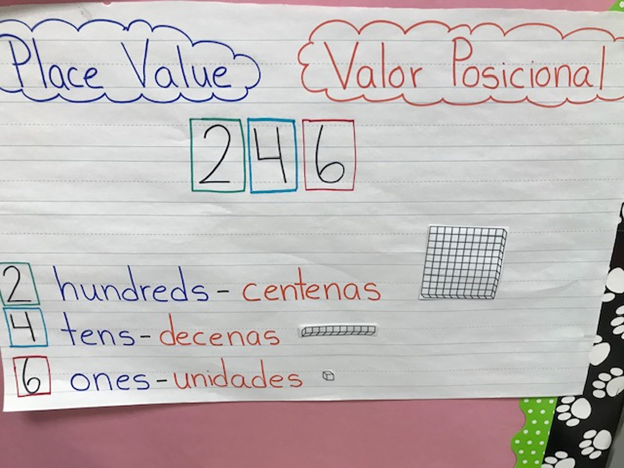 Regardless, the purpose of the word wall remains the same -- help your students acquire academic vocabulary, and use it correctly in their academic discussions and writing. To learn more about word walls, consult the "Interactive Word Wall" strategy in the BetterLesson Lab. 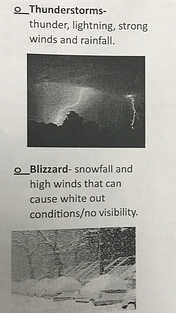 If students are still learning to read or may not already have prior knowledge of the academic language for a subject, pictures are a quick way for students to access their schema and build a foundation for their learning. 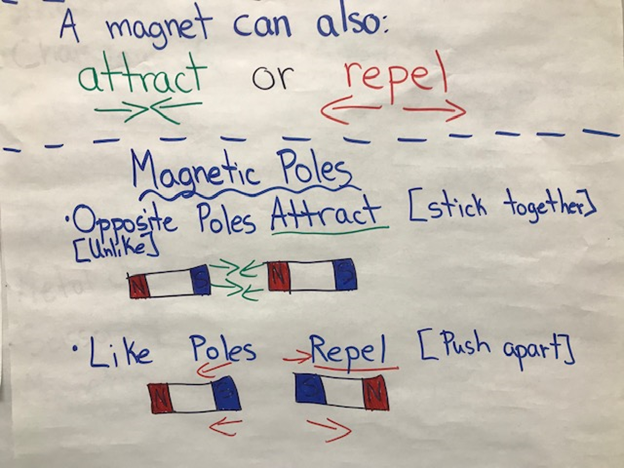 Visuals are a more concrete way for students to process new information, and may trigger a more authentic response to a subject versus lists of unrecognizable words. 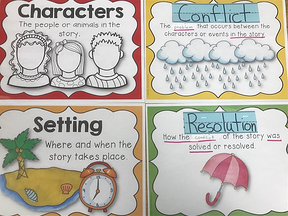 Visuals help the students make connections to concepts, and give them a starting point to build-upon in their daily learning. 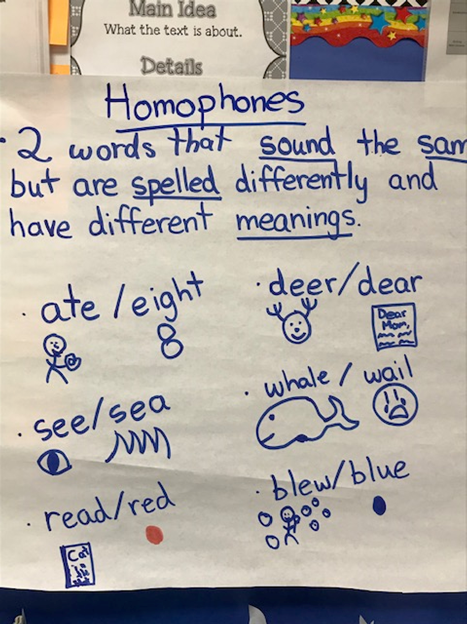 Anchor charts are a quick and easy way to introduce a new concept whole-group and can include either hand drawn pictures or prepped photos. By having visuals paired with their corresponding words, students are more easily able to access their schema of knowledge and grasp new concepts at a faster rate. Also, I typically create the anchor charts with the students, instead of beforehand. 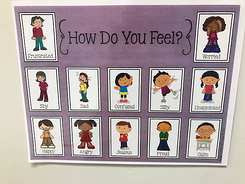 This helps students to establish an authentic academic connection and view the anchor chart as a concrete resource. To learn more about how to create anchor charts, consult the "Anchor Chart" strategy in the BetterLesson Lab. Another important aspect of helping students acquire new academic language is to explicitly teach vocabulary word meaning. Typically the vocabulary words will already be a part of the lesson plan, but I will choose 3-5 words beforehand to focus on for that lesson. When I introduce the new vocabulary, I will have a simple picture matched with the word and a student-friendly definition. By including the visual, word, and meaning, students have multiple points of access to grasp the new word and make it a part of their academic language. Furthermore, by frontloading vocabulary, students will more easily be able to follow increasingly in-depth lessons later on in the corresponding unit. When assessing students on writing assignments or unit projects, I typically include visual checklists or rubrics for student convenience and also to show them exactly what the step-by-step expectations are for a high-quality assignment. These checklists should be student friendly and easy for them to understand the final product. Quick, simple checklists could be integrated for formative assessments. The checklist may be completed independently, in pairs, small-groups, or 1-on-1 with the teacher. For larger assignments or projects, I may create a teacher model showing them what each phase of the writing process or unit project should include. This helps give students a clearer understanding of the expectations from beginning to end. Writing Checklist located next to the Work on Writing rotation. 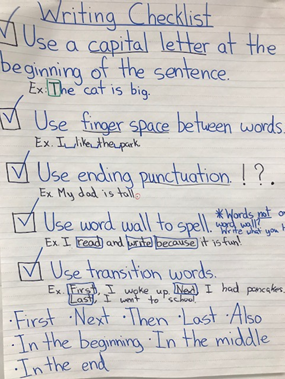 Students use the checklist to edit and revise their work on writing journal. 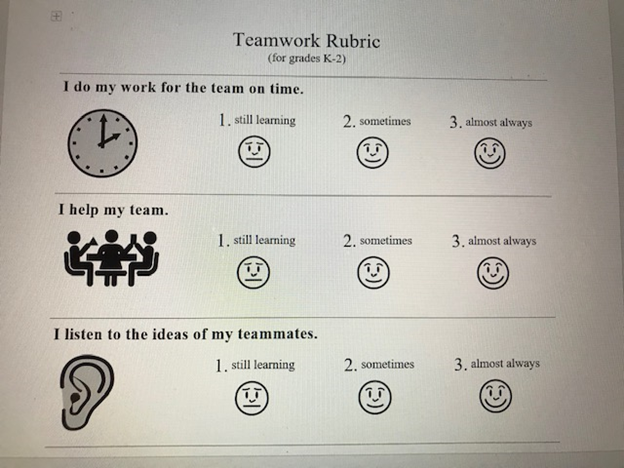 Rubric (portion) used for self-assessment during Project Based Learning (PBL) Unit. Another strategy I use around the classroom for my lower leveled readers and ELs is visual cue cards. 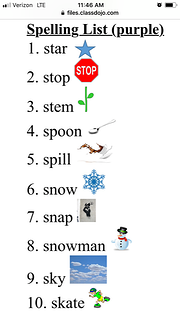 These are small cards placed around the room to help students increase their vocabulary and serve as labels for common supplies in the classroom environment, and can either be found online or made using simple pictures or photographs. 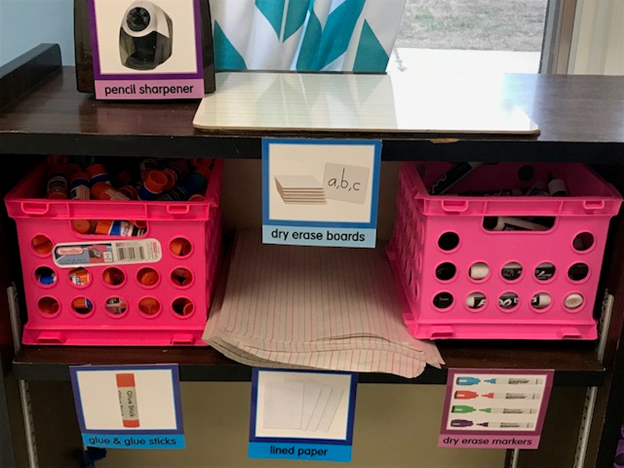 I have found that using visual cue cards also helps with classroom organization since students quickly know where to go to restock on supplies, get necessary materials for rotations or independent work, or return extra supplies found at the end of the school day. This, in turn, increases in students a sense of ownership of the classroom. Visual cue cards are used as labels around the room. The cue cards pair the picture and word together. The visual cue cards serve as a label of supplies for students. 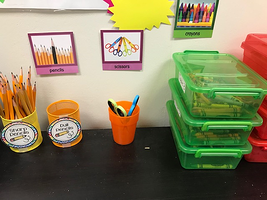 This helps to increase classroom organization, since students are able to quickly find or return supplies to the correct place. I recommend picking one of the strategies above to start with and incorporating it slowly and completely before adding in another one. Pairing the four language domains (Listening, Speaking, Reading, Writing) with the vocabulary strategies explained above helps promote student success within the classroom. In short, vocabulary paired with opportunity equals accessibility. Set your students up for success now. Plant the foundations for vocabulary, and the students will flourish.